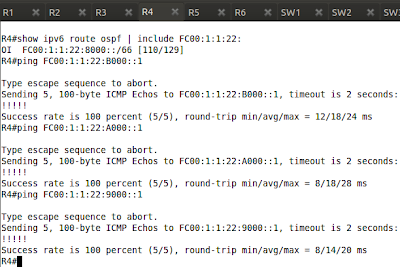 Configure IPv6 addresses on Serial1/0 of R2 and R3. Use router's number as the IPv6 Host ID and Network ID as per topology diagram. 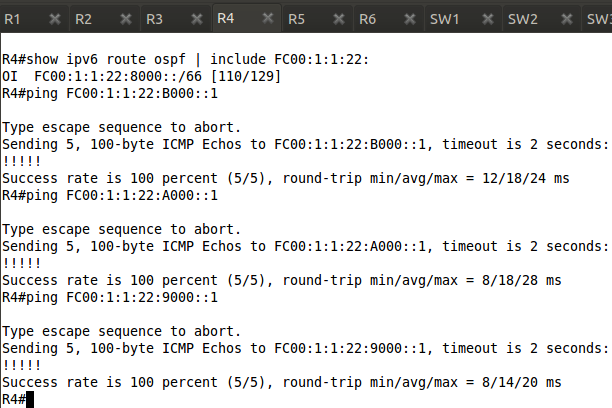 Enable OSPFv3 between R2 and R3 using their point-to-point link. Use Area 13. Enable OSPFv3 Area 13 on the above loopbacks. Ensure that the rest of OSPFv3 domain receive a summary route representing all the loopbacks advertised into OSPF in task 3. Pic. 2 - R2 and R3 OSPFv3 Neighbors. Pic. 3 - R4 Receives the Loopback1-4 Network Prefixes. Pic. 4 - R4 IPv6 Connectivity.